FLAT RATE SHIPPING: Aside from an entirely new design, of the biggest change you will notice is our new flat rate shipping fee. Going forward, all domestic orders going to any of the lower 48 states will ship USPS Priority Mail for a flat fee of $7.95, no matter what you buy. We have eliminated our table rates, meaning that for orders $29.99 and up, you will save between $1-$5 in shipping over our old shipping prices. This is our first shipping fee change since we started the website over a decade ago. Shipping rates have gone up significantly over the years, so we are hoping this new shipping model will be a welcome change. Currently, there are only two exceptions to this flat rate fee…diploma frames and tailgating tents…they will continue to have a $20 surcharge (above the flat rate fee) to cover excessive size and weight fees. For more information about shipping, returns, exchanges, in-store pick-up and more, be sure to check out all of our new customer service links at the bottom of the home page. ACCOUNT DASHBOARDS & STREAMLINED CHECKOUT: After hearing for years, that many customers had trouble accessing their personal accounts on our old website, we have built an entirely new backend with enhanced features to help you keep track of your orders. Online check-out will also be more streamlined. We hope this will simplify and speed up the check-out process and allow you to easily keep tabs on your orders as they are processed. WISHLISTS: You now have the option to create wish lists by clicking the hearts next to each product. Social buttons allow you to share your list on all your favorite social media websites or via e-mail, so when you need to drop a hint…or a few…we’ve got you covered. FAN-TASTIC BLOG: We are looking forward to creating an online space to really showcase our products, share ideas and extend our community beyond the physical boundaries of our store. If you can’t make it in to National…we will bring National to you! If blogs aren’t your thing, you can still connect with us via Facebook, Instagram, Pinterest or our periodic Newsletter, called Fan Mail. 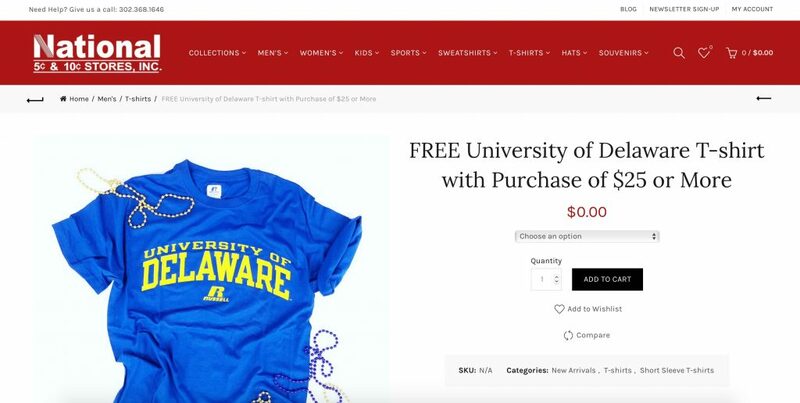 FREE T-SHIRT PROMOTION: In order to properly celebrate the launch of our new website, we are offering a free University of Delaware T-shirt with any online order over $25 starting on Friday, March 2, 2018. We’ve created a listing for our free promotional t-shirt, so be sure to add it to your cart and select a size before you check out. Your total purchase must be $25 or greater before shipping fees. Offer valid while supplies last. We’re very excited to hear what you think, so please leave us comments below or reach out to us via e-mail or social media. We are anticipating a few glitches during the first few weeks, so please be patient with us, while we settle into our new online digs. If anything goes wrong with any part of your online ordering process, we want to know! Please let us know how we can make it better. Thanks so much for all of your ongoing support of our small local business! We appreciate each and everyone one of you and hope you enjoy shopping the new site! Get Your Green On, Delaware!